Ichthus Fellowship Ministry: LHM Daily Devotions - THE SON OF GOD? LHM Daily Devotions - THE SON OF GOD? When the centurion and those who were with him, keeping watch over Jesus, saw the earthquake and what took place, they were filled with awe and said, "Truly this was the Son of God!" The centurion and his soldiers were keeping watch over the dying Jesus. As the hours wore on, they heard those words mentioned again and again: "The Son of God... the Son of God..."
They heard it from the endless stream of people passing by, going in and out of Jerusalem: "Save yourself! If you are the Son of God, come down from the cross." They heard it from the religious leaders who came out to gloat over Jesus' suffering: "He saved others; He cannot save Himself. He is the King of Israel; let Him come down now from the cross, and we will believe in Him. He trusts in God; let God deliver Him now, if He desires Him. For He said, 'I am the Son of God'" (Matthew 27:40-43). The centurion might have wondered: What did they mean, "Son of God"? That was a title of the Roman emperor. Was Jesus a rebel? But then, there were also the old stories of Roman gods who had children with human women. Their sons became heroes like Hercules or Perseus. Jesus didn't look like a hero. After all, you could hardly find a weaker man than someone dying on a cross. And then Jesus cried out with a loud voice and died—and there was a great earthquake. The rocks split and tombs were shattered. The centurion was deeply impressed by the power he witnessed. And he gave his verdict: "Surely this was the Son of God!" The centurion was right to be impressed by God's power. And we are right to thank God for the even greater power we know He unleashed at that time—the hour Jesus destroyed death, the day He broke open the gates of hell, so that no human being ever needs to be imprisoned there forever. Now the gates of paradise are open to us. If only we trust in Jesus, the Son of God, we are set free and brought into the kingdom of God our Father. THE PRAYER: Thank You, Lord, for rescuing us from the power of evil. Amen. What kinds of power do you find most impressive? When have you seen a case of weakness that turned out to be true strength? If "Son of God" means power to many people, what meanings do you think Jesus' title "Son of Man" means? 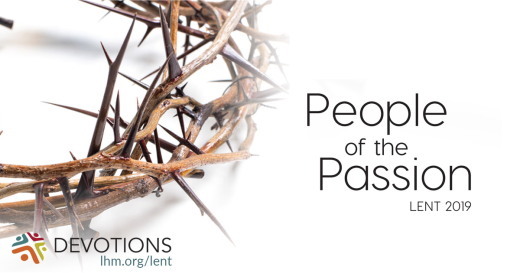 Lenten Devotions were written by Dr. Kari Vo. Use these devotions in your newsletter and bulletin! Used by permission; all rights reserved by the Int'l LLL (LHM).